Note: DNA Collectibles wanted us to review their scale models so bad, they sent us two models to review. To maintain journalistic integrity, we are giving them away. You’ll find code words in this article, a version of this article on Hooniverse, and on the Live and Let Diecast podcast available on Shout Engine, iTunes, and other places you get podcasts. Put together the code phrase successfully, email it to us at thelaldpodcast@gmail.com and you might just win one of these DNA Collectible models! Their first scale model car in production was the Saab 9-3 Viggen Convertible. It became available on February 9, 2017. It is a 1/18 scale resin model in Lightning Blue with a grey interior. A Saab? Saabs were never huge sellers, though they certainly have a devoted following to this very day, even though the company went out of business in 2014, depending on how you look at the company’s storied history. The 9-3 was former owner General Motors’ incarnation of the venerable Saab 900. In a 2002 review, Car and Driver’s Brock Yates pointed out that “Saabs are an acquired taste, like single-malt Scotch and reggae.” Indeed, both are really good, but they don’t sell like Coke and Rap music. This is DNA’s magic. They are building scale models which are odd yet enticing at the same time. So far there are no Ferraris or Lamborghinis. Not a single Bugatti is available on the site. But they do offer a cornucopia of cars you may know and love or scratch your head wondering where they came up some of these cars. If it makes you wonder, “what’s next from these guys?” They posted a line drawing of London’s iconic Big Ben in orange as a subtle clue as to their next offering. The car was the Bond Bug. It was a microcar and it was indeed very orange. There was a total of 2,270 Bond Bugs produced according to the Bond Owners Club. This is a niche car if ever there were one. 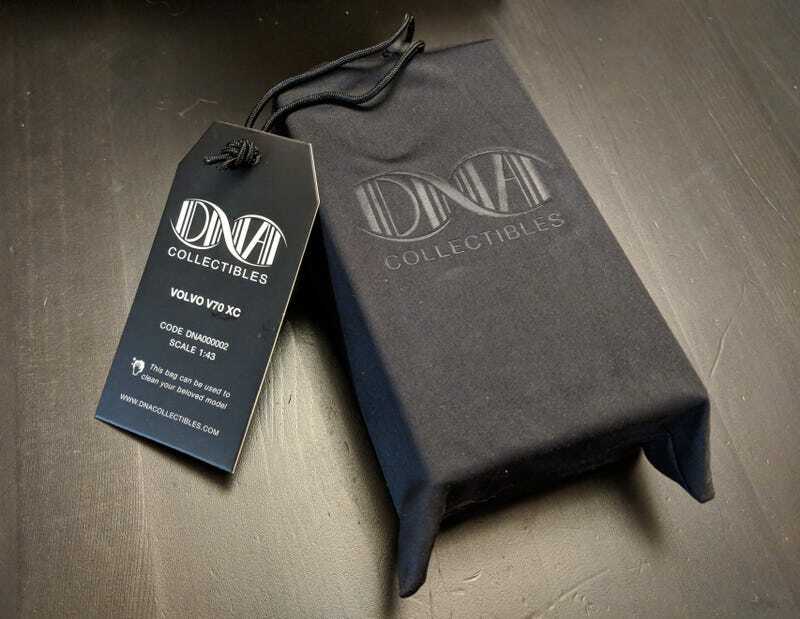 We reached out to DNA Collectibles to see if we could get some samples of their work. They agreed and asked us to let them know what we wanted. Naturally we wanted the Saab Viggen 9-3 Convertible. The Saab retails for about $136 (US). But what else? Did we want an Audi Avant 20V Quattro? An Audi S4? The Bond Bug? A Fuldamobil S6 (Google it, it’s very interesting. Or read LaLDer Jonee’s amazing history of the company!)? How about the Honda Urban EV Concept? We finally decided we needed a 1/43 scale model car to go with the 1/18 scale Saab, and picked another Swedish car, the Volvo V70 XC Cross Country. The 1/43 scale Volvo retails for $60. We devised a complicated plan of sending the cars from one reviewer to the next until five Live and Let Diecast authors had their turn to look at the cars, photograph them, and write down their thoughts. After we finished all of this, we got together on our Podcast, Live and Let Diecast, and chatted about DNA and the cars for an entire episode. First, we’ll look at the Saab. Live and Let Diecast co-founder Philip van den Hout and resident European-born intellectual and Porschephile, came away very impressed. “My first impression of DNA is a great one. Right out of the box the whole package looks exclusive and tasteful. The bag with the tag is a great touch, and the clear acrylic base makes DNA stand out from other model manufacturers. The cars are held in place very sturdily, with no fear of movement during transportation or display. Lloyd Gaston, Live and Let Diecast’s writer “Pillarless Coupe”, likes the Saab as well, but brings up some concerns about the cost and value for the dollar: “It has great display presence as you would expect of a resin car at this price point, but it doesn’t seem to be significantly better than the Ottomobiles and Best of Shows that I have, that were ½ to ⅔ the cost. Paint quality and overall fit and finish are excellent, the latter of which is not a guarantee with Otto. I’m impressed by the lens work, especially the headlights, which seem to have an appropriate level of depth to them. This is a basic thing that model makers don’t always get right on these older cars with the “brick” style headlights. The interior of the DNA is on a higher level than many other brands. The instrument panel and various buttons have legible labels and there is actual depth to those buttons. There is a downside to the interior however, and that is the center console, which seems to be about half as high as it should be.” Lloyd goes into depth explaining his opinion on the price to value for the DNA models in the companion podcast episode to this article. “DNA came onto the scene swinging, debuting with the Saab 9-3 Viggen convertible. There isn’t anything more impressive than making the very first model you ever produce a convertible. You better get all of your interior details spot on; you can’t hide them behind a roof. DNA has done just that with their Saab Viggen. Every button and every switch is there, right down to the adjustment knob to dim the interior lights. Most importantly, the key is on the floor, because it’s a Saab and it’s aircraft inspired. This is, by far, the best interior I’ve ever witnessed in a model. The fun doesn’t stop there though. Look closely at those headlight wipers! DNA didn’t go the knock-off route and mold some wiper-looking things into the front bumper. They actually made tiny wipers to attach to the headlamps! If you are a sucker for high-class details, you’ll love the badges, turn signals with real lenses, and perforated grilles. Dan Mosqueda was next to review. “The Volvo V70 XC Cross Country is an exquisite 1/43 scale model representation of what is the cliché journalistic dream car. Station wagon. Brown. Manual. It even came with a diesel engine in Europe. This mid to late ‘90s car saw 53,857 copies made according to Volvo. DNA is producing just 370 numbered pieces. I am the 1/43 collector of the group and I fell in love with this press model as soon as I opened it. Its chiseled Swedish front end poked out of the soft black bag first and I was smitten. So much, in fact, that I bought one for myself. Mine is Chassis No. 262. Like Philip, I was astounded by the detail in this model, particularly considering the retail price of $60 (US). I have an amazing Porsche 911R in 1/43 scale by Spark, which I thought it was sheer perfection. However, that car retailed for $96 (US) for a limited-edition version, even if cheaper versions by Spark and Minichamps can be found online. Philip echoed Lloyd: “The Volvo V70 XC is very detailed, especially in the interior, where the wood grain dashboard and center console trim is accurately represented. There is a little bit of glue residue on the rear window frame, but nothing you can spot unless you take close up photos and pore over them. In the outdoor shots the metal flake in the brown paint is perhaps a little out of scale, but the brown paint does sparkle nicely in the sun light. Overall, I’m very impressed with the fit and finish of the model, and would definitely recommend buying one without hesitation, if you are looking for a brown, manual wagon in 1/43 scale.” The code for this article is: “to drink”. Ryan Frosten, a station wagon connoisseur who drives a VW Sportwagen, felt much the same way as the rest of us. “I want the XC70 for my personal collection as the paint is very nice to look at with the metallic flake and the photo etched grille is a nice touch that most 1/43 scale models lack.” What else is there to say, Ryan put his money where his mouth is and ordered two DNA models, including the Subaru Leone 1800 Turbo and the 1991 Audi 200 Avant 20V Quattro. Be sure and listen to our podcast episode on these models. We go into much deeper discussion. And again, we are giving away the two press models. Search for the “code” in this article, the one on the Hooniverse, and of course in the podcast. Email us the completed code at thelaldpodcast@gmail.com for your chance to win one of these two outstanding resin models.